In the shape of Kasbah with l' old. 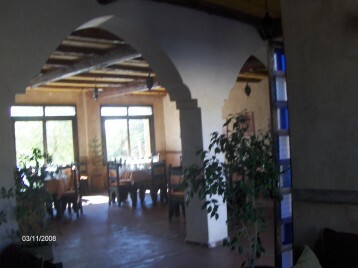 A terrace with sight on the famous Kasbah of Taourirt, a shop with l' entry of the restaurant with the Bio product sales under our mark LINABIO, the restaurant-gallery, at the ground floor, crockery of potteries of Tamgroute, the terrace with its grill and a sight on the Kasbah, the valley and the lake, the lounge with under ground, environment wrought iron and colors Indian, its cupboard with cigars, under solos d' Berber instruments. Come to taste our dishes fine, coloured and natural (skewer of camels to mint fraiche and grilled almonds, tajines of kid to grasses of l' atlas, melted with the chocolate house) with the corner of the fire of chimney in winter or on terasse panoramic in summer. In an environment of Kasbah to the coated walls with l' old where you still feel l' odor of l' incense, the ground is strewn with carpet, there, you will escape under Berber airs of musics. Let us treat the taste with the respect of nature. Our products result from organic farming and biodynamics. We organize receptions, meal d' businesses. We can accomodate groups; with 150 people. A n' do not space like the others! "Tous nos viandes & légumes sont certifiés bio"